Written by Estelle Vedome of Plan International. Since early 2012, Mali has faced a humanitarian and political crisis which has led to the displacement of more than half a million people internally, as well as outside its borders into neighboring countries. The events involved an inconclusive military coup and a French-led military intervention against the armed insurgents who were threatening to advance south from the northern territories. 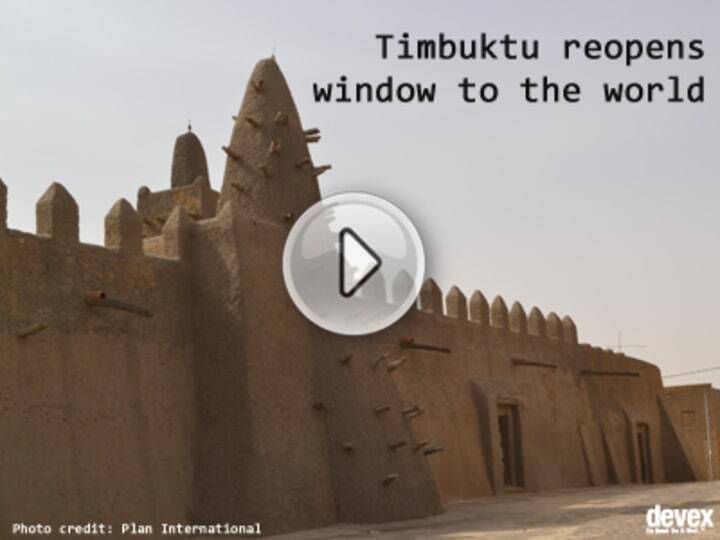 Timbuktu, home to the world-renowned ancient Koranic Sankore University, was among the towns taken by the rebels. As thousands fled for safety, Timbuktu came under strict sharia law, leading to attacks on civil liberties and varying forms of violence. Women and children were among the worst affected. It has been six months since Timbuktu, along with the other northern regions of Mali, was liberated. The city of the 333 Saints experienced hard times under the insurgents, with widespread curtailment of human rights and suspension of school activities for thousands of children. Now that the government is back in control and the region is mostly secure, normal activities are gradually resuming. International humanitarian organizations like Plan International are stepping in to support the Malian authorities in restoring order and addressing the needs of the local population. Plan’s response in the region has remained centered around children’s needs, particularly their education and protection. Half the schools in Timbuktu have not yet reopened. The main challenge is not only the return of all children to school but also sufficient number of qualified teachers to teach and supervise them. About 64 percent of children in the region are still out of school. Households, already under pressure to meet their basic needs, are finding it difficult to cover the cost of sending their children back to schools. Additional challenges are insecurity around schools in rural areas, involvement of children in subsistence labor, low capacity of schools to accommodate more children, and lack of school feeding facilities. For children that are lucky to restart lessons, things are moving smoothly. Hawa, a 13-year-old 7th grade student, is back in school. Her family stayed in Timbuktu for the whole period of occupation but she was not able to go to school for this entire duration. “I had nothing to do other than play with my siblings and read some books. Now, I am happy to be back in school. I missed it all the time,” she says. Beyond the humanitarian emergency created by the conflict, landlocked Mali is also affected by a Sahel-wide food and nutrition crisis that further eroded the resilience of millions of people already suffering from chronic poverty. Plan became one of the first iNGOs to start a humanitarian response to the crisis. Since May 2012, we have been responding to people affected by both the food crisis and the internal conflict, and so far supported more than 10000 children return to school. Join the Devex communityand gain access to more in-depth analysis, breaking news and business advice — and a host of other services — on international development, humanitarian aid and global health.